JOHNSON'S® cotton buds are made from only 100% pure cotton tips and 100% paper sticks. Pure cotton is naturally absorbent and gentle. 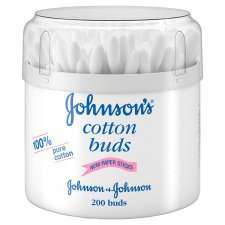 Some of you may have noticed a change in JOHNSON'S® cotton buds recently, from blue plastic to white paper sticks. We have decided to remove the plastic and replace it with 100% paper in support of wider campaigns to protect the environment by reducing plastic waste in our country's rivers and seas. Our decision to switch has been welcomed by environmental organisations. Big claims about paper and not plastic and the idiots put a clear plastic lid on the bloody box, pretty sure people know what they look like, so another completely useless piece of plastic waste. So annoying a company this size cannot see this staring them in the face, especially when they go to the lengths of redesigning the product and bang on about the environment. The sneaky penny pinching mugs now make them in paper not plastic. Took away the edge of it being the best cotton bud. Now, it falls into the budget category, like all the others. I bought from Amazon 6 for £3 less 5% for S&S. Not worth any more now they are paper and weak. Certainly not worth 90p. The absolute nerve of J&J to use "ocean protection" as an excuse to downgrade the materials and charge the same money. Cos we all throw our cotton buds in the ocean first thing in the morning from our bedrooms and bathrooms do't we? Deal posting newbie! This is ihpawca first deal post. Help out by leaving a posting tip or just to show your appreciation for their contribution.